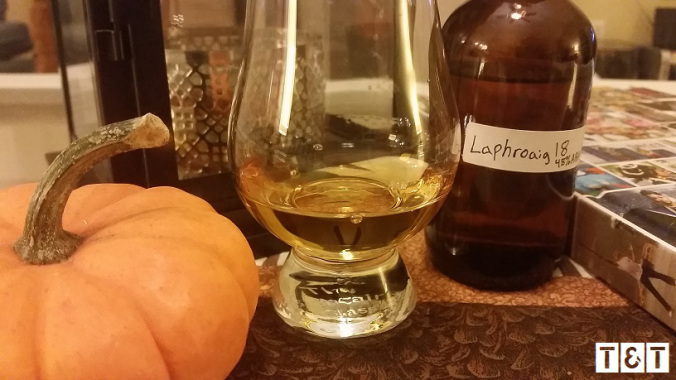 Laphroaig is my favorite Scotch distillery. I’ve at least tasted most of their regular line-up (the Triple Wood was one of my favorites up to this point and my review of it can be found here). But, since Scotch is so expensive in the States (and always going up in price) I don’t keep a lot of it stocked in my bar. I love the level of peat in Laphroaig’s. However, as I’ve begun to try more and more whiskey my tastebuds have evolved. I’ve begun to enjoy the drams from the more delicate side of the Scotch aisle. I am actually drinking 16 year old Laphroaig right this minute.